Photorealistic terrain rendered from real satellite photos and elevation data of Bosnia and Ukraine. Truly dynamic campaign system--never the same mission twice. Active cockpit--On-screen switches and controls are not just for looks, they're fully functional. Instant action, single missions, and campaign play. Huge variety of planes and vehicles, all actively participating in the ground and air war. Multiple levels of difficulty for novices and aces alike. Modem and network support--Declare war on your friends! 3D acceleration support for Direct 3D-compatible graphics accelerators. First Look, First Shot, First Kill. F-22 Raptor. 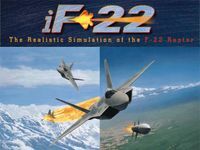 Lockheed Martin Aeronautical Systems, Lockheed Martin Tactical Aircraft Systems, and Boeing Defense & Space Group's Military Airplanes Division are teamed to develop the F-22 as the replacement for the F-15. The fast, agile and stealthy F-22 will be the Air Force's frontline fighter of the 21st century with much improved capability over current Air Force aircraft. From the onset of the battle, the F-22's primary objective will be to establish air dominance through the counter-air operations. The F-22 also has an inherent air-to-surface capability. The F-22 incorporates the latest technological gains in low observables, avionics, materials, engine performance and aerodynamic design. Knowledge gained from proven weapon systems such as the F-15, F-16 and F117A formed the foundation for F-22 development.